There is nothing like the smell of burnt rubber, suntan lotion and stale beer on people’s breath at 10 in the morning. 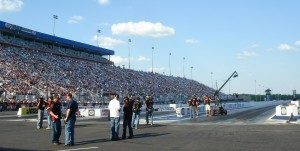 That’s what the scene was like at the zMAX Dragway in Concord, NC for the production of SPEED Channel’s hit show PINKS All Out. 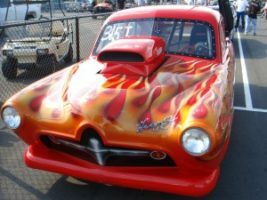 Hundreds of drag racers from around the country came to show off their custom built cars and just how fast they could get them going. The contest pits drivers against each another in an all day shootout. Only the sixteen cars with the best time make the finals. Then it’s heads up racing till a winner is decided. 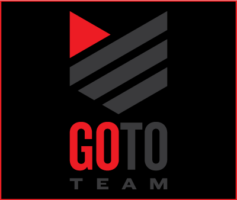 Go To Team’s Virginia based HD video crew traveled down from Richmond to the Charlotte area to capture the event for SPEED. We were on driver profile duty, so we cruised around the track to find the most interesting characters and tell their stories. And let me tell you, there are some characters! From the nine-year-old kid who knew more about cars than I ever will, to the shirtless, rough-necked guy that was accused of sandbagging, we saw it all. 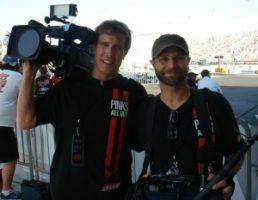 In the end, only one driver can walk away a champion but it is the journey to victory lane that makes the show great. PINKS All Out from zMAX Dragway is scheduled to air August 6th on SPEED. Check it out!